By the end of the day Armenia fedayis have liberated the city. Vazgen Sarkisyan has never got marred but the Wedding in the mountains was a success and a new start in Liberation movement. /PanARMENIAN.Net/ Nagorno-Artsax Republic's President Arkady Ghukasian gave a speech at the solemn meeting dedicated to the Great Patriotic War Victory day held in the house of the officers of the NKR Defense Army. As «Arminfo» agency reports, the concert with performance of the NKR Defense Army brass band, the children's musical groups as well as the draughts, backgammon and chess competition were held in the Nelson Stepanian park. In the course of the events, dedicated to the Victory Day, the Great Patriotic War veterans were presented with gifts. The fountain-memorial was unveiled in honor of Artsakh's lost soldiers on the initiative of one of the public organizations of Gyumri town in the NKR's Victory Square. Ten years ago, on May 6, 1992, an Armenian delegation led by the first president of Armenia Levon Ter-Petrosian departed for Tehran by the invitation of then Iranian president Rafsanjani. Armenian president was personally received by his Iranian counterpart at the ‘Mehrabad’ airport of Iranian capital. On the same day the acting president of Azerbaijan Yaghub Mamedov was also visiting Tehran, and also received a high level reception by the Iranian president. But the two presidents left Iran with totally different moods. When Levon Ter-Petrosian returned to homeland the Armenian flag was already fluttering in liberated Shushi. From that day on and up to now the ‘traitors who surrendered Shushi’ have been searched for in Azerbaijan. In 1995 the Azeri ex-minister of defense Rahim Ghaziyev was accused of surrendering Shushi and Lachin and was sentenced to death… whereas Ghazieyv ran from the Baku’s national security jail a year before his punishment was set. The liberation of Shushi by Armenian Karabagh war volunteers was a blow for Iran as well- it was deprived of the role of mediator in the negotiation process of Karabagh conflict regulation. The fact that the Iranian president invited Levon Ter-Petrosian and Yaghub Mamedov to Tehran simultaneously is of course not a coincidence. During the May 7 negotiations on regulation of the situation existing on the borders of Armenia and Azerbaijan, rapprochement of opinions and easing of tension, with Rafsanjani in attendance, the leaders of the two conflicting countries agreed on a 8-clause document, the 3-rd and 4-th clauses of which read as follows: ‘The sides agreed to adjust all the issues of the conflict based on the norms of international rights and principles of Council for Security and Cooperation in Europe (CSCE). The sides stressed the necessity of coming to a mutually favorable regulation of border disputes and Karabagh conflict, based on the UN regulations and international law norms’. Late on May 8 (1992) the Armenian delegation lead by Ter-Petrosian returned to Armenia. Shushi was already liberated by that time, although Armenians celebrate the holiday on May 9. Some time after the above-mentioned negotiations Iranian foreign minister Vayezi visited Yerevan, and handed the protest letter of Rafsanjani concerning the ‘capture’ of Shushi by Armenian armed forces over to Levon Ter-Petrosian. To this Armenian president answered with his characteristic frankness that he had nothing to do with it and that it was the handwork of Armenian Revolutionary Federation. Of course it is easy to assess the historical events that are already in the past. But, in reality, the absence of Levon Ter-Petrosian from Armenia on May 6 to 8 was historically justified, especially if we bear in mind that the Armenian president was discussing urgent issues for the country in Tehran. Mr. Ter-Petrosian was and today also is a realistic politician, and just like in 1992, today as well does not accept ‘maximalism’ in politics. And most probably for the first Armenian president the liberation of Shushi should have been a manifestation of ‘maximalism’. Of course all this is already history, but we should not forget that the glorious victory of Shushi was achieved at the cost of the selfless Armenian soldiers’ blood. For the first time, May 8 is celebrated as Yerkrapah Day in Armenia. Those who were killed in the Artsax war were remembered today at the Yerablur Pantheon. On May 8, 1992, the city of Shushi was liberated after 71 years of Azeri rule, thanks to the brilliant military actions of Artsax’s self-defense forces. This year marks the 10th anniversary of liberation of Shushi. Celebrations are already underway in Artsax. Armenian leaders have sent congratulatory messages on the occasion of the Yerkrapah Day and the Liberation of Shushi. Prime Minister Andranik Margarian has left for Artsax to participate in the festivities. YEREVAN (Armenpress)—Solemn ceremonies dedicated to the 10th anniversary of the liberation of Shoushi, the Day of the Nagorno Artsax Defense Army and victory in World War II began May 10. As part of the activities, Artsax President Arkady Ghoukassian, Armenian Defense Minister Serge Sarkisian, Artsax Prime Minister Anushavan Daniyelyan, Parliament Speaker Oleg Yesayan, head of the Artsakh diocese of the Armenian Apostolic Church Archbishop Pargev Martirosyan, other officials and the public visited the Shoushi Christ the Savior (Kazanchetsots) Cathedral and participated in a service. Nagorno Artsax officials and the Armenian defense minister visited the Stepanakert cultural center to see an exhibition of Artsakh painters dedicated to the liberation of Shoushi and victory in WW II. President Ghoukassian, during a short interview, said, "Without Shoushi we would not have other glorious victories. Shoushi was the beginning. I remember the words of Armenian Defense Minister Serge Sarkisian when he asked whether it would be possible to celebrate the victory in 10 years time. Now we are celebrating it. Nothing is impossible in the world. Now the most urgent things on our agenda are formation of the state, a peaceful life, development of the economy and social security." Hundreds of World War II veterans and thousands of younger Armenians paid tribute May 10 to almost 300,000 Armenians that were killed between 1941 and 1945 in WW II in events celebrating the 57th anniversary of Soviet victory in the World War II, a public holiday in Armenia. Armenian President Robert Kocharian who is expected to be back on May 10 from a week-long trip to Argentina, Uruguay and Brazil has sent a congratulatory message which says, "The May 1945 Victory gave our people a historic opportunity to return to a peaceful and creative work and to build our country." Residents of Nagorno Artsax are also marking Victory Day along with the tenth anniversary of the liberation of strategically important town of Shoushi. An Armenian delegation led by Prime Minister Margarian is in Artsax to attend the official ceremonies there. On Wednesday, Nagorno-Artsax Republic president Arkady Ghoukassian attended a special requiem Mass at the St. Ghazanchetsots church perched atop the highest point in Shoushi, officially opening day-long celebrations in the republic. "Dear compatriots, I congratulate you on the occasion of the Victory and Peace Day. The victory in May, 1945, gave our people a historic opportunity to return to peaceful and creative work and to build up the country. "It was a victorious peace, and hundreds of thousands of Armenians contributed to it notably. They kept the honor of Armenian soldier high in the war that became known as the Great Patriotic War. "With the liberation of Shoushi in 1992, May 9 received a second meaning, when the worthy heirs of their glorious fathers proved once and for all that they would no longer tolerate violation of the Armenian people's national rights and human liberties. "I congratulate you all, and particularly the veterans, on the occasion of this great holiday, and wish you excellent health, good festive mood and peaceful skies." The Catholicos of All Armenians Karekin II addressed a message to Nagorno Artsax President Arkady Ghoukassian blessing and congratulating the president and the entire people of Artsakh on the occasion of the 10th anniversary of the liberation of Shoushi. The message says that the heroic battle of Shoushi became a turning-point in the war for the liberation of Artsakh. "Together with our people scattered all over the world, we are marking the 10th anniversary of the liberation of Shoushi with special joy, remembering our glorious warriors who sacrificed their lives in the name of their Motherland in our prayers. We are glad that the people of Artsakh, who won their freedom, mark the 10th anniversary of Shoushi's liberation with successes in building up a new life and with confidence and faith in the future." Armenia's Parliament Speaker Armen Khachatrian gave a congratulatory message, which says: "I congratulate Armenian people on the Victory day and Shoushi liberation. I express gratitude to veterans, soldiers of our powerful army, who provided our victory and liberated the ancient Shoushi." has any of you have any info -?? pictures ?? /PanARMENIAN.Net/ May 9 Armenia is celebrating the Victory Day and the Yerkrapah (Union of Volunteers) Day. As RA Defense Minister's Spokesman, Colonel Seyran Shahsuraryan told PanARMENIAN.Net, the Yerablur pantheon will be attended and a solemn sitting will be held in the Sports and Concert Complex after K. Demirchyan. May 9 wreaths will be laid to the monument to the Unknown Soldier in the Victory Park. A military parade will take place in the Republic Square in Yerevan. In the evening a holiday concert will be finished with fireworks in the Victory Park. To note, May 9 is also celebrated as the Day of Liberation of Shushi. Attendance of the Stepanakert Memorial Complex, meetings with the veterans of the Great Patriotic War and the Karabakh war as well as concerts are scheduled. Besides, League of War Reporters NGO will organize a photo exhibition dedicated to the period of the Azeri-Karabakh war. Allthough it would have been nice if they have mentioned the numbers of participants, casualities from both sides, the opposing side's numbers, equipment also who except azeris were fighting against us. It is well known that Shamil Basayev and other chechens were among azeris in Shushi. Finally what happened to the enemy after the city was liberated. Edited by Error 404, 17 November 2007 - 09:42 PM. YEREVAN (Combined Sources)--The heroic liberation of Shoushi, a turning point in the Artsax Self-Defense movement, was organized and carried out without the approval of Armenia's senior leadership, Artsax War Veteran Arkady Ter-Tadeveosian told a press conference on Tuesday. A veteran of the Artsax Liberation mopvement, Ter-Tadevosian, also known by his comrades as “Comandos,” organized and executed the liberation of Shoushi from Azeri occupation. But Armenia's leadership at the time didn't believe that the liberation of Shoushi would be possible, he explained. 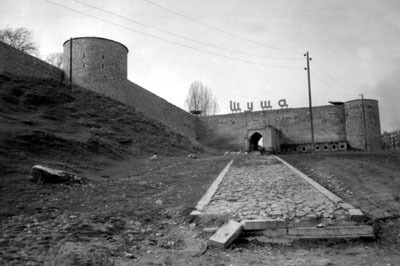 Outnumbered, outgunned and at a tactical disadvantage, Armenian freedom fighters under Ter-Tadevosian's command were charged with the duty of attacking an impregnable fortress. The Liberation of the strategically vital mountain town was the first significant military victory during the Nagorno-Artsax liberation movement. The Battle took place on May 9, 1992 and ending swiftly when Armenian forces captured and drove out the Azerbaijani occupying forces. “The liberation of Shoushi was a question of life or death for us,” Ter-Tadevosian stressed. After a hail of Azeri military bombardment from Shoushi had begun shelling Stepanakert, military commanders based in Artsax began demanding that the Nagorno-Artsax Defense Forces carry out the risky operation to liberate the town. Due to its strategic position, Shoushi could be easily defended, making a direct attack impossible for the outnumbered Armenians. Ter-Tadevosian therefore devised a strategy of launching several diversionary attacks against the adjacent villages to draw the Azeri's out of Shoushi. Prior to the offensive Ter-Tatevosyan's forces had been concentrating an artillery barrage from several directions for several weeks in order to “soften up” the town's defenses. When the Azeri's had been drawn out, the Armenian forces encircled and cut off the town from further reinforcements. Several days after the liberation, Armenian forces were able to liberate the Lachin corridor, connecting Artsax to Armenia proper. about "the occupied Shushi". Every year officials and "simple citizens"
city", our neighbors should finally read the historical chronicles. khan Panakh, in 1752 by the help of the traitor Varanda Shakhnazar. fortress remained with the Persians. given by the "Caucasian Calendar"). Persian Empire, which has remained after its breakdown. the victims of the formed gangs. liberated exactly by the day when Heydar Aliyev was born. When we were in Shushi there was a tank turret and part of a truck in back and to the right side of Surp Maryam's. The Church had been repaired but the new stones could be seen, they were much smoother, and it had been painted white. Being there I felt tears in my throat. An Armenian Copter circled overhead, we were relieved to see that is was Hyes in the sky's. On TV in Armenia, there was a documentary in which the Armenian fighters were taking communion, a priest had been able to get in, this was before they had able to liberate Shushi. Edited by onjig, 23 February 2013 - 04:01 PM. Shushi Liberators Remember the Cost of Victory: "For 12 hours straight the walls were under fire"
Zhora Faryan was the first fighter who entered the battered St. Ghazanchetsots Church and lit a candle after the liberation of Shushi. Many believed that the church had been mined. That's why many remained outside and lit candles on the walls. But Zhora, a unit commander of the Shushi Special Battalion, told me that a photographer beat him to the punch and entered first. "You know, when a photographer enters the church, a guy not carrying a gun and not a fighter, it's kind of embarrassing not to follow," said Zhora, adding that the photographer was Hakob Poghosyan. The assault on Shushi was scheduled to start on May 5 but a sudden snowfall delayed the launch. Zhora participated in the town's liberation and entered from the direction of the village of Shosh. "We started out on the night of May 7. It was pitch black and you couldn't see your hand in front of your face. We entered the chasm and climbed up the cliff to the first position and then started to run. The enemy opened fire but saw that we kept coming, that we weren't afraid," recounts Zhora. Samvel Zohrabyan, another member of the Special Battalion, was some 150 meters behind Zhora. Samvel says the most intense fighting took place on May 8. Samvel was a deputy unit commander who says that all the fighters knew what they had to do before the assault was launched. They were handed 900 rounds of ammo apiece. Samvel says that the fighters preferred carrying bullets rather than food and that they ate nothing for the next 40 hours. "The fighting was fierce. We were on the second line of assault after Zhora's unit. When we reached a point some 200 meters from the walls of the city, fire rained down like hail from all sides. But we kept firing on the ramparts for the next 12 hours straight," says Samvel Zohrabyan. Zhora says that on May 8 they advanced several times on Shushi but withdrew until they heard about Bekor Ashot's unit entry into the town. "They told us to change direction and enter towards the direction of the Russian church. It was the morning of May 9. We advanced towards the area of the St. Ghazanchetsots Church," says Zhora Faryan. Samvel Zohrabyan kept a running daily account of their advance on Shushi in his war diary. He recounted how their advance ran parallel with that of the guys in the Oudjan unit. "We didn't meet up with them until we entered the town. It was 10am on May 9. When we made our descent the residents were running behind our vehicle out of joy. The blessings heaped on us from the women folk is something I can't describe," Samvel said. Zhora Faryan remembers how the Armenians asked him to enter the town on foot so that residents could welcome them. "One old man was crying and embraced me and said 'give me your knife so that I can sacrifice a rooster'. When the assault was over they asked me what I wished for at that exact moment. I answered that I wanted five minutes to go to Abovyan and see how the people were celebrating there," said Zhora, adding that he told no one back in his hometown of Abovyan that he was going to Shushi. His family only heard about his exploits on the TV. Yesayi Barseghyan fought to liberate Shushi and advanced on the town from the direction of Djanhasan-Kyosalar. He says that the unit was an amalgam of guys pulled from Gyumri, Abovyan, Nerkin Charbakh, Kosh and Oudjan units. Barseghyan says that for ten days before the final push on Shushi, Arkady Ter-Tadevosyan (Commandos) had ordered 150-200 men to ascend during daylight and secretly fall back at night to create the impression in the mind of the enemy that Armenian forces were gathering in large numbers. Yesayi was severely injured in the assault and was miraculously pulled to safety by his comrades. Zohrab Khachatryan also participated in the assault on Shushi and recounts the following incident. "It was 2:20 in the morning. We reached our position faster than expected. In front of us was an Azeri tank. We had two anti-tank mines. I grabbed them and placed them in the tank treads. I then thought it best that we capture the tank so I ran back and removed the mines." Zhora Faryan says that about 700 fighters took part in the liberation of Shushi. He's displeased that a greater number than this have been awarded medals and other decorations. "The lies have chewed up the truth. Today, many of those medal recipients can't even point to Shushi on a map. Those straight-up boys who actually fought to liberate the town have been overlooked. It isn't right." Samvel Zohrabyan, who now works as the principal of the Aramous high school, says he's pleased that the St. Ghazanchetsots Church has been renovated in harmony with its surroundings but notes that the ruins of the war haven't been removed. "Some twenty meters from the church you can still see the refuse from the 1990s. Shushi can be transformed into the second Armenian spiritual center. I believe that our benefactors and businessmen should continue the work we started and beautify the town," Samvel argues. Zhora Faryan, who now works as a mechanic, added that he was overjoyed when Shushi was liberated but is disappointed with its current state. "They simply wish to show that the town isn't ours. They are showing this to the Turks as well. They don't fix it up and don't repopulate it. Other than repairing the St. Ghazanchetsots Church, what else has been done there ever since 1994? Why are they improving Stepanakert to the point where it resembles Northern Avenue in Yerevan, but they continue to neglect Shushi?" "I would pack up my family and move to Shushi with great pleasure. And I'd take 15-20 families with me. But there's no place to go. Nature has provided everything to live there, water and the land. So why doesn't the government build there? Last week I visited Kelbajar. When I saw what beautiful white houses they have built in those ruined villages, when I saw the children and the school, I said to myself, thank God that we didn't spill Armenian blood in vain. There are people there, living on the land. The same should be done everywhere." Yesayi Barseghyan, who was gravely wounded in the liberation of Shushi and still hasn't been granted disability status or a war pension, believes that Shushi will slowly be rebuilt. "Hey, it's not like the town can be fixed overnight," he noted. the Armenian nation. Shushi was liberated on this day 23 years ago. capital Stepanakert and adjacent Armenian village. Ter-Tadevosyan, the Commander of the self-defense forces of Artsakh. the rival had left Shushi.